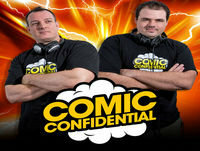 Welcome to Comic Confidential! Join hosts Kade &amp; Troy as they bring you the best of the week's comic and pop culture related news as well as review ALL the week's tv action, breaking down the top moments from hit shows like - The Walking Dead, Arrow, Supergirl, The Flash, Agents of SHIELD and more! On top of that there's movie reviews, comic recommendations and not to mention, general hilarity!